One archivist and curator of endangered and at risk television programming is discovering that there is a palimpsest of preserved historical data to be retrieved from VHS and Betamax tapes that might seem otherwise without much merit from a conservationist point of view in the form of teletext pages that were collaterally recorded along with the surface shows. 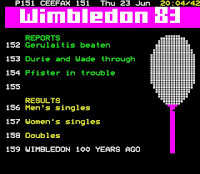 Before the internet and home-computers became ubiquitous, the Ceefax service furnished a wealth of information, as with these captured feeds from June of 1983—plus resources to be found at the link up top that have compiled whole days’ worth of behind the screen programming. 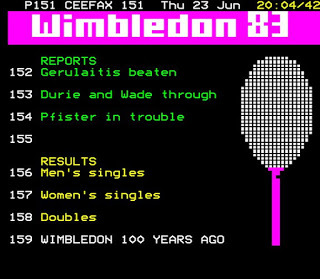 Most broadcasters ceased their teletext operations in the early- to mid- 2000s once the internet (especially news websites) became robust enough to handle high-traffic volumes but the service still continues for some in TV Land.